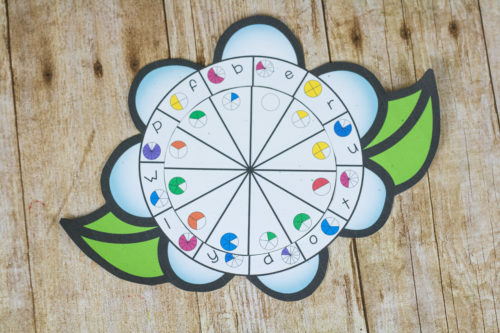 Equivalent fractions in a fun activity? Yes indeed! 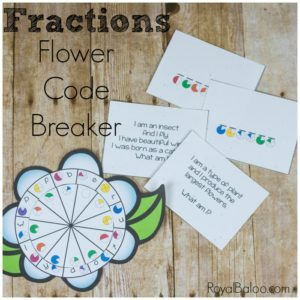 This flower fractions code breaker is sure to be a hit and also provide great practice with fractions. I remember the first time I encountered fractions in school. It was also the first time I had no clue what was going on. I had always been strong at math but I had never even heard of a fraction. Turns out, they’re not too difficult. It’s just a matter of practice. 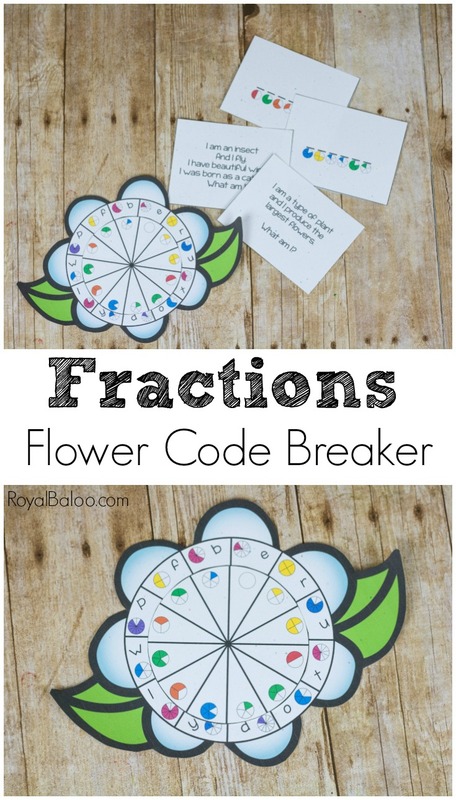 Which is why I wanted to make a code breaker to work on equivalent fractions! This is part of a Unit Study for older kids. 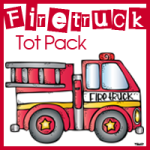 Make sure to scroll to the bottom for more links to activities with Wildflowers! I am loving these code breakers. They are so much fun and a great break from regular math work. I was really wanting some fraction work though so I added fractions in! These are all about equivalent fractions! And let me tell you, it’s a challenge. It’s not as simple as just lining them up real quick! There were a few I was counting the number of slices to compare. I recommend printing on cardstock or laminating. These will not stand up to a lot of use with just regular paper. Cut everything out on the outer black lines. Then line up the smaller circle with the bigger circle and make a hole in the middle. It needs to be big enough to fit a brad through it but not so big that the brad falls through the hole. Your smaller circle should be able to spin freely. The cards need to be printed double sided so the hint is on one side and the code on the other. Alternately, you can print on separate pages and tape them together. But you’ll have to make sure to match the right ones up! 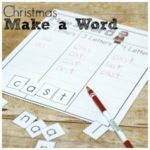 There are four codes to work through with this set. 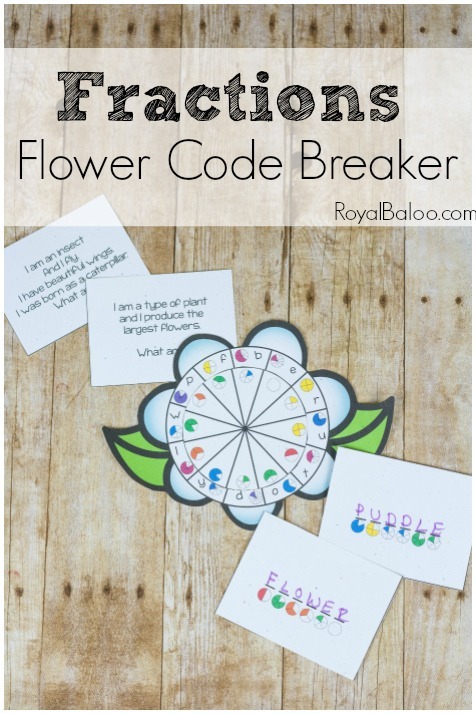 You can make your own codes but make sure to look at the letters on the code breaker! 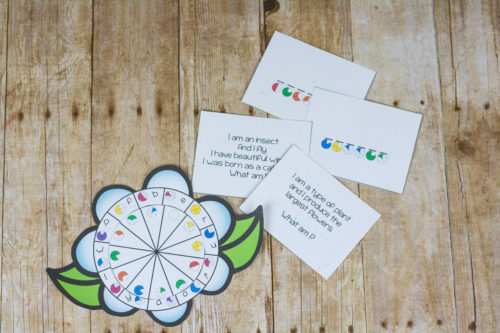 Check out more activities for a great Wildflower Unit study!